Several weeks ago I purchased a Groupon for admission to the Deer Valley Rock Art Center in Phoenix, AZ. I’ve lived here in the Valley for over ten years and had no idea that this place existed. The Deer Valley Rock Art Center was established to preserve the 1,500 ancient petroglyphs at the Hedgpeth Hills petroglyph site. The center is operated by the Arizona State University’s School of Human Evolution and Social Change. 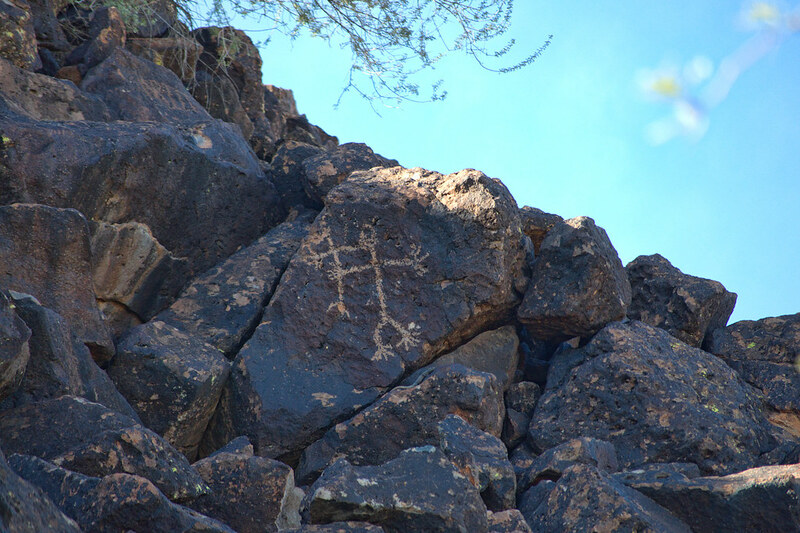 The petroglyphs at the site were made by people hundreds, even thousands, of years ago, and have continuing significance for Native American people of this region. The Hedgpeth Hills petroglyph site is listed on the National Register of Historic Places. It is the second archaeological site to be listed on the Phoenix Historic Property Register. The very first thing I can tell you is this: If you’re planning to shoot pictures of the ‘glyphs, go there in the morning. All the petroglyphs face east, and when you’re trying to photograph them or even see them in the mid-afternoon sun as we were, it’s tough. We found ourselves staring into the sun a lot. I started out using my normal kit lens (18-55mm) with a polarizer, but since Nikon did not see fit to include a lens hood with this lens, I was getting tons of flare. My able-bodied assistant (my hubby!) tried holding the Center’s brochure above the end of my lens and that helped some. It finally dawned on me that I had my telephoto lens (55-200mm) in my camera bag–ON MY BACK–and it does have a lens hood. So I quickly switched lenses and things improved from there. It was a good thing that I did, because just around the bend in the path we reached the main site of the ‘glyphs, and they’re mostly higher up on the hillside facing east. The zoom lens is essential for capturing the details of the rock art from a vantage point on the ground. Here’s my favorite shot of the day, for two reasons. First, it’s a great petroglyph, very clear and defined. And secondly, there’s a lizard right at the feet of the ‘glyph that I didn’t even notice until I started processing. Bonus!! I’ll definitely go back to the Center, but in the morning hours, to try my shots again with some different lighting. If you’re interested in this kind of thing, be sure to check it out. The pathway to the rock art is only about a quarter-mile long, and it’s handicapped-accessible. You can learn more at dvrac.asu.edu. This entry was posted in Information, Learning, Shooting and tagged archaeology, Arizona, Arizona State University, ASU, AZ, camera, D5000, Deer Valley Rock Art, desert, Hedgpeth Hills, Nikon, Paint Shop Pro, petroglyph, Phoenix, photography, Topaz. Bookmark the permalink.